A. Piper Burgi has pursued a variety of diverse careers. After honorably completing her tour of duty in the Air Force, and a short stint as an Air Force contractor, she began her journey as a military spouse, moving with her pilot husband from coast to coast. She is the author of five non-fiction books and recently added the historical fiction novels IN THE SHADOW OF HER MAJESTY and THE COUNTRY GIRL EMPRESS to her ever-expanding collection of published writings. A lifelong student and lover of history, Mrs. Burgi was always and still is fascinated with historical events. She grew up with stories about the most beautiful and fascinating Empress Elisabeth of Austria, and remembers all too well, the first time she heard of the English King Henry VIII and his six wives in high school. In 2011, after she picked up a few books about the iconic Henry and his many wives on a whim, she was hooked once again. This simple step reignited her love of history, and she has not stopped learning ever since. When she is not busy chasing after her three dogs or holding on tightly to a good cup of coffee, she can be found typing away on her computer. The Country Girl Empress tells of the early days of Princess Elisabeth, daughter of Duke Max in Bavaria, called Sisi within the family. We follow her story from birth to the day she married Franz Joseph, son of Archduchess Sophie of Austria and her feeble-minded husband, Archduke Franz Carl. Born on Christmas Eve, little Sisi was not a particularly beautiful baby; her elder sister Néné was much prettier and her mother, Princess Ludovika of Bavaria and sister to Sophie, the Archduchess, planned early on a match between their children - Néné and Franz Joseph. Both Néné and Sisi grew up moving between their country house in Possenhofen and their palatial residence in Munich. Both girls, especially Sisi, were allowed a lot of freedom, and the younger sister had much in common with her father, who was more than a little eccentric. They both adored horses and would take long rides together in the countryside and performed in their own private circus built next to the palace. Since Néné was destined to marry the Emperor’s son, she was granted less freedom and received a more conventional education. Today we would call Sisi a ‘wild child’ who attracted more than a few romantic overtures from young men, all of which were nipped in the bud by her ever-watchful mother. I thoroughly enjoyed reading The Country Girl Empress by A. Piper Burgi. The characters flew off the page and I connected with Sisi; she was such a delight, albeit a little spoilt. I loved reading about her father who was such a character and, like his daughter, had little time for the strict conventions of the age in high society. This book takes you back to Austria in the 19th century, with the intrigue of two sisters planning a liaison between their children, who frankly were not interested in each other. Then fate takes an unexpected turn and a romance blossoms where none is expected. The author skillfully transports the reader to mid-Europe almost 200 years ago and the quality of research shines through. I hope there will be another book about Sisi’s later life as I shall certainly read it as soon as it is published. A well-deserved 5 stars from me. A royal life with its luxury, privileges, and comfort may seem enchanting from the outside but, if you value your freedom more, can all the riches fascinate you enough to be a part of royalty and be under the scrutiny of a kingdom or, perhaps, the world? The Country Girl Empress by A. Piper Burgi explores this choice in a very heartfelt manner. Princess Elisabeth, fondly known as Sisi, was born to Duke Max and his wife, Ludovika. While Ludovika had high hopes for her older daughter, Helene, she had less than any significant hopes for her tomboy daughter, Sisi. With all of Ludovika's attention on making an empress out of Helene, Sisi got plenty of time to enjoy her childhood and cultivate her personality. She enjoyed being outdoors rather than indoors. Horse riding appealed to her more than dressing up. Ludovika had no hopes for her chubby little Sisi, but Duke Max loved his freedom-loving daughter more than any other of his children. However, when love enters Sisi's young heart, she must choose between familiar freedom and the love of her life. The Country Girl Empress is a remarkable read that unfolds at a leisurely pace. Various aspects of royal lives with all of their privileges and losses are highlighted in so much depth that I, as a reader, found myself in the middle of it all. Not many people consider the trials that a royal family goes through every day in exchange for the privileges of being royalty; however, the author has ensured that everyone understands the price they must pay to be in that position. The characters are developed throughout the plot. There is not a single insignificant character; rather, they are all defined and bound together intricately by the author. In reading the brief summary of the book, I thought that the only important character would be Sisi, but the author ensured that each character got the due justice that they deserve and each has a story to tell. The story developed slowly, filled with several twists and turns. The rise and fall of the empire, the wisdom of women in maintaining the dignity of the royal families, romance, many sacrifices for the kingdom, and many other elements tie together to make a magnificent read. I could not have picked up a better book to take me back in time. 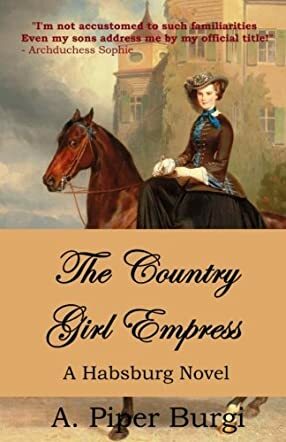 Life as a princess may seem glamorous, but young Elisabeth of the House of Wittlesbach in Bavaria was more than happy to have her freedom to ride her horse and tend to her beloved animals in The Country Girl Empress by A. Piper Burgi. Sisi, as Elisabeth was affectionately known, was the younger sister of the girl destined to become the Empress of Austria, and she did not mind not having to undergo the instruction and regimented life that her mother and Aunt Sophie, the Archduchess of Austria, insisted Helene follow. Sisi grew up in a period of political turmoil during which the ruling houses of Europe were threatened with defeat, due to a growing call for more democratic forms of government. The members of the nobility were far removed from the daily cares of the rest of the population and held determinedly on to their power. Sisi followed in her father’s footsteps and preferred to remain removed from political intrigue, but fate had something else in store. It is impossible to overcome the desires of the heart when you meet that one special person, even if protocol says it is not possible. Can Sisi overcome her fears and indeed become the next Empress of Austria? A. Piper Burgi has intertwined an engrossing fictional account of the everyday activities of Sisi of Bavaria with the very real and turbulent political and social events of the time in The Country Girl Empress. In-depth research provides the facts while a delightful narrative drives the story of Sisi and her family in the context of the greater European power alliances, so that you feel you are living the events alongside this family. The characters are well developed with all the ups and downs that are the true marks of living a full life. You feel for Sisi as her world changes drastically. The story flows well, even with so much historical detail. This is a must-read for historical fiction fans who can appreciate the imperial intrigues as well as the personal yearnings of a unique figure who is thrust onto the world stage rather suddenly at a very young age. Wonderful story! I particularly enjoyed it since I have been to many of the places mentioned. Overall, well done and enjoyable.